Yes, I am here to extol the joys of portable, self contained, alcoholic beverages. I fondly remember the days where anything could be made better by a six-pack (or two) of my favorite beer, heck you could take a can of beer anywhere, it came in its own serving container, just pop the top and enjoy… none of that pesky bottle opening, cork closing, annoying wine glass business you have with a bottle of Merlot. So wine never got to be the beach beverage of choice.. or tailgate parties, picnics or sporting events. (anywhere convenience was a factor) Until now. 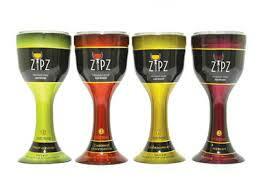 Meet Zipz Wine, a neat solution that brings you premium wines in a very sophisticated single serve “glass” that lets you take your wine with you, almost anywhere you want to go, yet still be able to sip it in style. Each 100% recyclable Zipz Wine “glass” is covered in a special, patented plastic wrap that you simply peel off, allowing you to remove the lid which is then simply snapped to the bottom of the base, becoming the foot. It looks and feels like real glass, but won’t cause a problem if dropped near your pool or patio… neat! Sure, I still love a good beer, but a lovely glass of wine is always a treat, and Zipz is serving up some premium California wines like Chardonnay, Merlot, Cabernet Sauvignon and a nice Pinot Grigio. I can see some poolside Cabernet in my future, if you can see some in yours, visit Zachys.com or find a local retailer at Zipzwine.com. Cheers!